Last month I was asked to participate along with a group of other bloggers in a Berrylicious blog link up. This was such perfect timing considering I was dealing with a berry tree of my own. Read below to learn more about my berry experience. Thank you Hani, from Haniela's for organizing such a fun linky party! At the end of this post you will find a banner along with the links to all those that participated. ENJOY. When I think of berries I have very fond memories of my youth. I grew up in California and we always had an abundant supply of strawberries. As a teenager we moved to Oregon and there I was introduced to the wild Blackberry. It seemed in Utah, we ate a lot of blueberries. Last June we moved to our home in Maryland and to our pleasant surprise we had a berry tree. This huge tree made an even bigger mess. What in the world was this tree that dumped a ton of berries all over most of our yard? My neighbors had an aversion to the tree…LOL It was a constant source of agitation because your shoes were covered in berry juice. This meant that carpets and floors were constantly stained with little purple dots. The birds were another concern. They love the berries and when birds eat berries they have a very healthy digestive track if you know what I mean…it's gross…but it's true and they make a mess. Well, I was just too busy last year unpacking and getting settled to pay any attention to this big messy berry tree. After all, do berries really grow on a tree that is 25 feet tall? If you're a Mulberry tree you do. This year I promised myself that I would use these berries and learn about them. 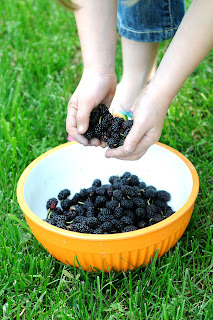 I discovered that they are Mulberries. 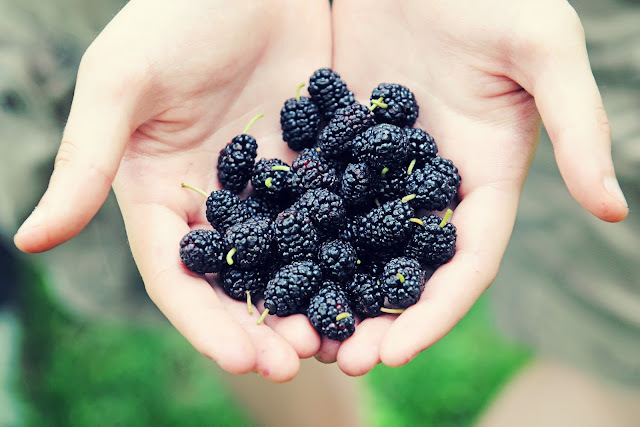 They are shaped like a black berry, but smaller and have a very similar taste. I was happy. We used to live in Oregon and they have wild black berries everywhere. I missed them. On this sunny day, my daughters and I set out to forage for the berries. We were not brave enough to climb up the tree and shimmy out on the limbs. With our bowl in hand, we gently stepped around the blades of grass and found what we were looking for. You could tell the ones that had fallen recently, they were still shiny and plump. It was a great mother/daughter activity. 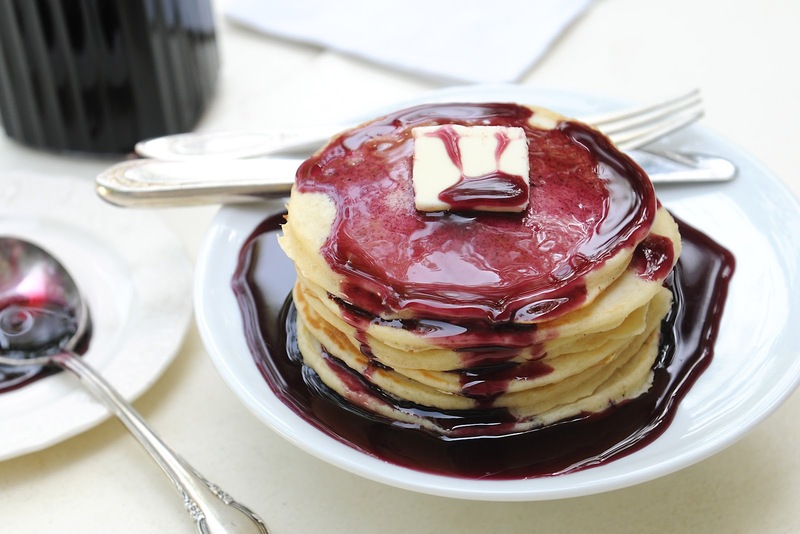 I chose to make a syrup because we love our pancakes soaked in the flavor of berries. With a little bit of butter added too. Recipe for a light and fluffy pancake can be found here, and for a mutli-grain pancake look here. They are both delicious. Making syrup is easy and you will find all types of recipes out in the cyber world to follow. Mine is simple and straight forward. It usually takes an hour for the sugar and juice to thicken enough to make it sticky and thick. I will admit that on some occasions I have been impatient and the syrup was thinner…everyone still used it. Wash and sift through berries to make sure that you don't have any extra and unwanted ingredients…leaves and bugs. Don't worry about the stems because they are a pain to take off and you will be straining everything anyways. 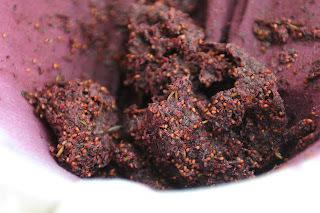 In a pot large enough to hold 6 cups, bring berries to a boil. Reduce heat to medium high. Using a potato smasher, smash the berries. Let the juice, pulp and water cook for 20 minutes. You can use any type of cheescloth/cloth straining set-up want or have access to. I kept mine pretty easy. 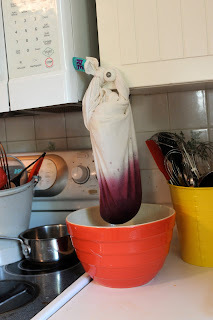 I used a dish cloth made out of light weight flour sack fabric and hung it from my cupboard while the juice drained into a bowl. You can let this drain overnight or if you are like me, let it cool, and then start wringing out the juice. You should get about 3 cups of juice. The pulp will look like this. Return the 3 cups of juice to a pot and add 2-3 cups of sugar. The more you add the sweeter the syrup will be. Bring syrup to a boil and turn heat to medium low. It takes about an hour for the syrup to thicken. Stir it occasionally so that it doesn't stick or burn on the bottom. You can test the thickness of the syrup by dipping a spoon, if the syrup is runny it will slide right off. If it is thick, it should coat your spoon and slowly slip out. 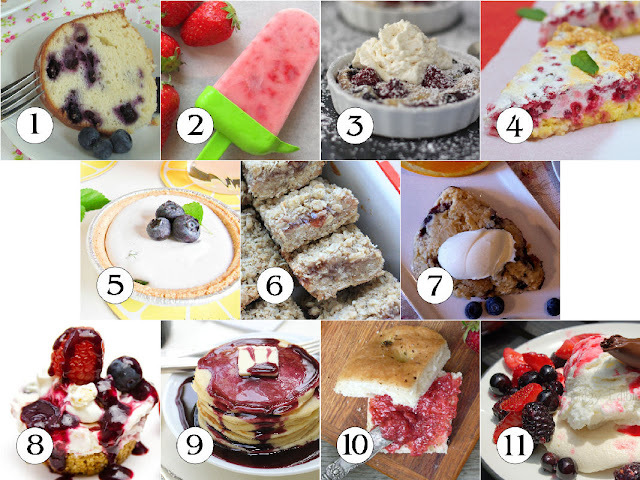 11 Fabulous Bloggers are sharing their Berrylicious Recipes. Go check them out. Sherron, I'm so glad I'm not the only one that hangs their cooked berries from a cabinet door to drain! I miss my berry plants, I have a few small ones but they don't produce enough to make anything with (grow, grow, grow!) My daughter does enjoy going out every morning and picking a small snack. You pancake stack is heaven on a plate, I could go for a short stack right now! That all sounds wonderful Ann. There's nothing better than sweet, fresh berries. Your syrup looks wonderful! 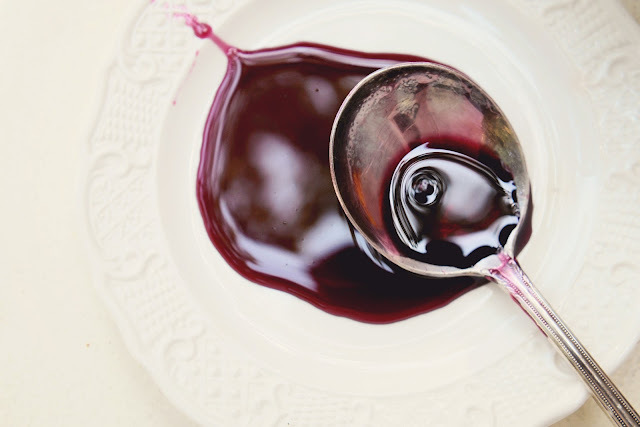 I love the idea of making your own syrup. 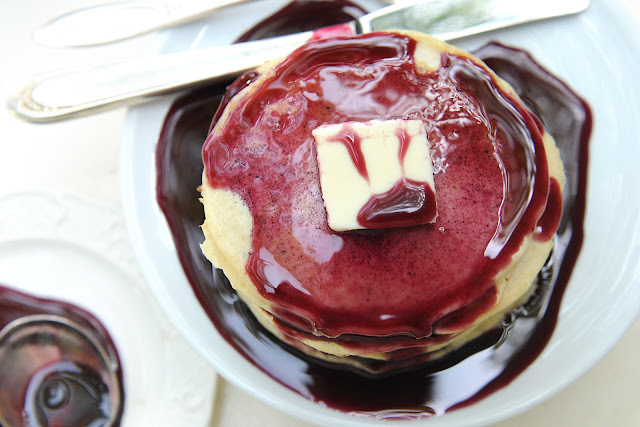 With pancakes it look absolutely delicious. I'm so glad to have discovered you, thanks to FB. Everything looks so inviting! 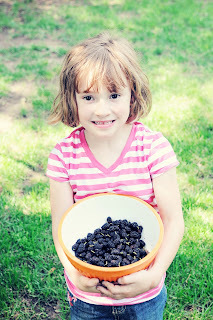 What a fun time picking berries and eating the fruit of your labor! Give or take, what is the shelf life on a syrup such as this? I imagine it would need to go right to the frig if it isn't used that same day...days, weeks, months? Can it be frozen and then un-thawed when desired? Hi Tina--I have had mine the refrigerator for up to a month. It may be able to go longer but before you use it, smell and taste a small bit. These are two ways to tell if something is still good.